Leesburg officials have accused The Villages of “cherrypicking” a land deal as the number of planned homes has been cut to 3,000 units. 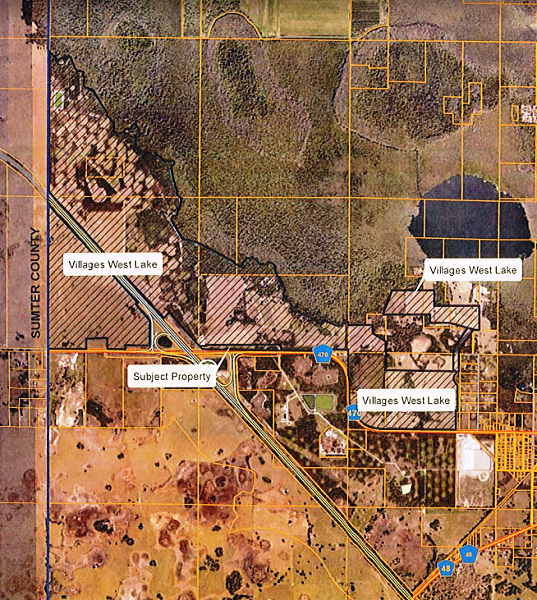 The Villages and the city currently are going through the due diligence process on a 1,127-acre parcel – the Villages of West Lake – located north of County Road 470 and east of the Florida Turnpike. The Villages originally wanted to purchase an additional 531 acres south of County Road 470. But City Manager Al Minner said that area needs to be retained as a spray field until The Villages is ready to accept 6 million gallons per day of reuse water on a yearly basis. Currently, the community can only take the reuse water nine months of the year, excluding its peak snowbird season. The Planning Commission debated The Villages’ plan to jettison some of the property that had been planned for purchase. “They don’t want the swamp land,” said Planning Commissioner Ted Bowersox. During the lengthy meeting, planning commissioners eventually voted to approve a comprehensive plan amendment changing the future land use on about 11 acres of the Villages’ purchase to age restricted development from industrial and technology commerce park. And they agreed with a request to rezone those acres to age restricted development from city planned unit development as well. But those decisions didn’t stop Commissioner Charles Townsend from joining in the “cherry picking” accusation by saying Leesburg would be picking up the tab for maintenance of the rejected land. And he went a a step further by accusing The Villages of deception. “I am voting in the affirmative, but I am suspect of the pricing. It wasn’t fully laid out for us. It was deceptive in the manner it was done, whether it was intentional or not,” he said. This map shows the Villages of West Lake in Leesburg and the 11-acre parcel involved in the comprehensive plan amendment and recommended rezoning action. Bowersox described it as a “knuckleball” by The Villages. “How come this didn’t come up in negotiations before?” he asked. The city manager said the city will likely be hanging on to the rejected property for three to five years. He said there might be an opportunity to sell it down the line to The Villages. The vote on the two Villages requests was 6-1, with Planning Commission member Donald Lukich voting against the plan. • Adds a list of existing age restricted developments in the city. Two items affecting the smaller parcel of land retained by Leesburg also were approved. Commissioners agreed to recommend changing the comprehensive plan amendment on the spray field/general municipal use property to institutional and conservation from age restricted development. And they backed the accompanying rezoning request taking the land to city public from age restricted and planned unit development. City commissioners are tentatively scheduled to hear a first reading on all five items at their regularly scheduled Oct. 8 meeting, with a second reading to follow Nov. 13. Also on Thursday, the commission voted to allow The Villages to erect cell towers within the development. A monopole off Bonita Boulevard in The Villages recently raised the ire of residents. The Villages won approval for the monopole from Sumter County. “We are the first step of the democratic process. The final decision is with the city commission,” said Planning Commission Chairman James Argento.